The Hycroft mine north of Winnemucca, NV is in the process of expanding operations. As part of this process, the Bureau of Land Management (BLM) is accepting public comments about the proposed expansion. I thought that readers of the Mining University website would be an appropriate group to make constructive comments about mining (hippies and environmental nuts need not apply). Include the following information: Name, Representing, Mailing Address, Telephone, Email Address along with your comments. All comments are due by March 12, 2012. To outline the project and the expansion, the permitting group at Allied Nevada has compiled the following outline. All comments to the BLM must be unique, so please don't just cut and paste this list. · The Hycroft Mine currently employs approximately 200 workers. The Proposed Action would increase the mine life by an additional 12 years and will more than double employment to 537 mine personnel by 2019. · The Proposed Action would add approximately 337 employees within six months of approval, which directly impacts the populations of the assessment area communities. · HRDI is one of the top ten employers in Humboldt County. With the addition of the workforce under the Proposed Action, HRDI would be one of the top three employers in Humboldt County. · With the economic downturn in 2008, the unemployment rate almost doubled between 2008 and 2009 in the assessment area. The increased employment resulting from the Proposed Action would potentially help reduce the unemployment rates in the assessment area. · Indirect employment effects resulting from the direct employment expansion. Using the Gold Mining economic sector employment multiplier, an additional 166 jobs could also be created in those communities in addition to the jobs created at the mine. Factoring in a household income multiplier, this would lead to a resultant increase of at least $7,348,531 in salaries not generated by the Project, through at least 2020. Under the Proposed Action, local economic, governmental and social resources would be positively impacted by an increase in employment, salaries, operating costs, sales and use taxes, property taxes, and net proceeds taxes. The property taxes and the sales and use taxes are collected by the counties. The net proceeds of minerals tax is collected by the state and a portion are distributed to the county where the minerals are mined. Humboldt and Pershing Counties are dependent on stable locally derived tax revenues. The bulk of these revenues are from property taxes. The projected tax revenues provide significant stability to the region’s governmental finances. Hycroft works in cooperation with Humboldt and Pershing Counties on road maintenance and improvement and will continue to provide maintenance, equipment, manpower, and materials to maintain safe roadways. · Sustainability is part of development including: Geothermal resource development, utilization of the existing railroad, support of infrastructure in the Black Rock Desert, communication enhancement for the area. · Hycroft is committed to environmental stewardship in maintaining permits and conducting compliance measures in accordance with federal, state, and local regulations. · The expansion has been designed to minimize and avoid environmental impact. · Visually, Hycroft will perform concurrent and interim reclamation whenever possible that will include revegetation to maintain landscape and minimize erosion. Post-mining the landscape will be made to look like surrounding landforms. · While 12,000 people currently work on mine sites in Nevada, more than 48,000 work for suppliers and service companies in every county in the state. · Every county in Nevada , except one (Carson City), has an operating mine. Thus, mine sites fuel billions of dollars into Nevada’s entire economy, not just rural economies. Reclaim the Project consistent with the proposed Reclamation Plan. Overview of the gigantic equipment on display at the Caterpillar booth at MINExpo 2012 in Las Vegas, NV. Two of the most confused terms in mining nomenclature are 'overall slope angle' and 'interramp slope angle.' I have put together some pictures to help illustrate the difference between the two terms and when you would use each. The foundation of any mine model is the drillhole data. In Maptek Vulcan, creating the drillhole database is a prerequisite to creating downhole composites for use in block model grade estimation. 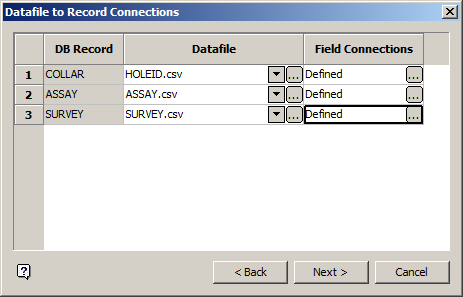 As with other tools in Vulcan, there are a number of ways to create the drillhole database but, all the methods require collar location and assay data.